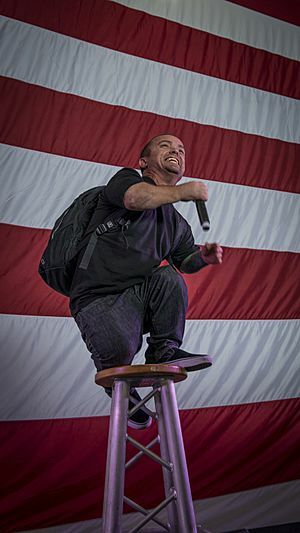 Jason Shannon Acuña (born May 16, 1973), better known by his stage name Wee Man, is an American actor, stunt performer, professional skateboarder, and television personality. He is one of the stars of Jackass on MTV and the host of Fox Sports Net's skateboarding show 54321. Born in Pisa, Italy, Acuña grew up in Torrance, California, and attended North High School. He is of Mexican and German descent. He was the subscription manager for the skateboard magazine Big Brother. His association with that magazine led him to become involved with the Jackass television series in 2001. In 2007, Acuña starred in the reality TV series Armed and Famous and in July 2007, Acuña appeared on TV as a host of MTV's Scarred Live. Acuña appeared on the first season of NBC's Celebrity Circus. In the fourth week of competition, he became the first contestant to receive a perfect score (a 10-point average). Acuña ended the season in third place. Acuña is an owner of a franchise store of the Chronic Tacos restaurant in Redondo Beach, California. In 2012, Wee Man starred in the direct-to-video holiday film, Elf-Man as the title character. This was his first role in a family-friendly feature film. Jason Acuña Facts for Kids. Kiddle Encyclopedia.